The JVI vibrating spiral conveyor (elevator) reduces the moisture content from 3% to 1.5% while elevating the material six feet. JVI’s engineering department worked closely with the customer to ensure the spiral elevator fulfills all the process requirements and fits within the limited available space. Data collected from in house material testing confirmed drying and feed rate properties to ensure a fit with the customer’s process and expectations. 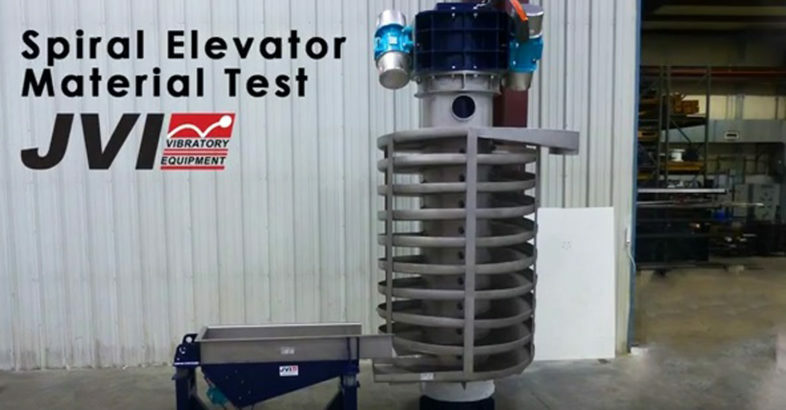 The system includes both the spiral and a bias discharge vibratory feeder specifically designed to evenly convey the material on to the spiral. The spiral is 12’ high and 4.5’ in diameter with a conveying height of 6’. The conveying surface is 115 feet long and circles around 11 times. The material contact area of the spiral and feeder are 304 stainless steel. Forced air is applied via a blower and integrated nozzles onto the material, which accelerates drying. The unbalanced motors on the spiral and feeder are certified Class II, Division I. The transfer of energy from the unbalanced motors to the spiral elevator generates microthrow motion to elevate the material. JVI Vibratory spiral elevators are ideal for cooling, elevating and drying processes. Spiral conveyors are available in a variety of finishes and sizes. The JVI team excels at working with customers to design vibratory solutions (feeders, screens & conveyors) that fit customer materials and processes.